Jennifer and her family were eagerly awaiting their 20-week ultrasound, when the gender of their second child would finally be revealed. Jennifer, a nurse by profession, had just finished a night shift when she made her way to her appointment at her workplace, anxious to find out the news. But during her exam, something alerted the technician that further investigation may be needed. Just one week later, Jennifer and Dan met with genetic counsellors who helped provide more information on the condition and help guide them in their decisions about next steps. 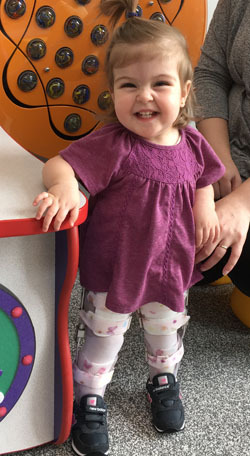 At 24 weeks, Jennifer was sent for a fetal MRI at the Children’s that confirmed the diagnosis: her their baby girl, Charlotte, had spina bifida type 4, the most severe form of the condition. Spina bifida is a condition that occurs in the first month of pregnancy around day 21, when the fetus’s neural tube develops. As the fetus grows, the arches of the vertebra that normally protect the spinal cord do not form properly so the spinal cord and its coverings are not protected. In some cases a sac can form and bulges out of the spine. In Charlotte’s case, her lesion was open and the spinal cord exposed. The severity of the newborn’s spina bifida depends on where the spinal cord is affected. Usually, the higher up the spinal cord it is found, the more serious the condition will be. Luckily, Charlotte’s lesion was lower on the spine, so her prognosis was more hopeful. 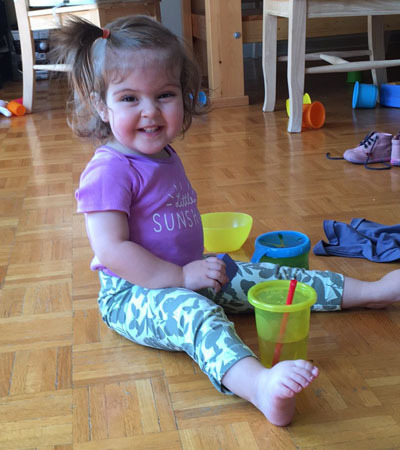 Hydrocephalus, a condition in which fluid accumulates in the brain, is another problem associated with spina bifida. It occurs when the fluid that goes from the brain around the spinal cord does not circulate properly. Because Charlotte would be faced with this complication immediately after birth, Jennifer and her Dan soon met with pediatric neurosurgeon Dr. Jeffrey Atkinson at the Children’s, who explained how their daughter would need an operation soon after she was born to close the lesion on her spine and possibly a shunt to help drain and redirect fluid from her brain to abdomen, and tried to walk them through what could happen.